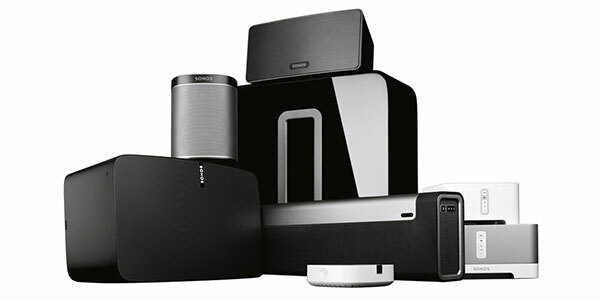 Sonos is the wireless Home Sound System that fills as many rooms as you want with great-sounding music, movies and TV. Stream via WiFi. Play whatever you’re craving. And amp up every moment with intense, pulse-pounding sound. It matters. Especially when the phone rings or the person with the music has to leave. With Sonos, the songs stream from your WiFi network (not your phone), so there’s never any of the dropouts, delays or interruptions associated with Bluetooth. The more rooms, the better. The real power of a Sonos system kicks in when you add more speakers. Suddenly you’re playing different songs in different rooms. Or grouping all your speakers together to blast one big jam to every room at once. No off-the-shelf stuff here. 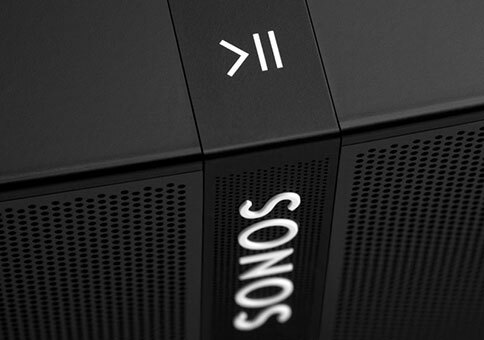 Every Sonos speaker is a carefully designed combination of custom-built components and proprietary software. We’re talking woofers and tweeters tailor-made to fit each speaker’s unique architecture. Internal smarts that instantly recognize how you’ve positioned your speaker then balance its output accordingly. And Trueplay custom tuning that makes sure your music always sounds great, no matter where you place your speaker. Simple setup. Better over time. No need to run speaker wires around the room. Just set your PLAYBAR up and connect it to your TV with a single optical cable. Then plug SUB in, it syncs up to your PLAYBAR wirelessly. No extra cables or special programming required. PLAYBAR. The soundbar for music lovers. This wireless, beautifully engineered soundbar provides spectacular audio for all your movies, TV shows, sports, and games—and streams your favorite music, too. Beats standard TV speakers: PLAYBAR has nine amplified drivers–six mid-woofers and three high range tweeters–for deeper lows, clearer dialog and more immersive sound effects than you can get from your built-in TV speakers. Sonos speech enhancement: PLAYBAR automatically sends dialog directly to the center channel where you can hear it best. Want even greater clarity? Turn on our exclusive Speech Enhancement option. Sonos night sound: This exclusive Sonos feature automatically boosts quiet sounds while lowering the volume and impact of more intense sound effects. With multiple ways to mount your new PLAYBAR in your new TV lift cabinet, American TV Lift will make sure your new PLAYBAR is mounted where you want it on your cabinet, giving you one out of the box experience that'll shake the walls! 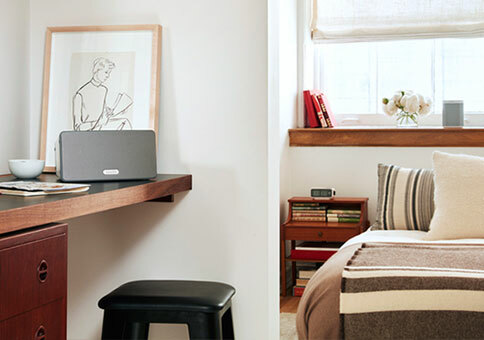 Sonos is the wireless Home Sound System that fills your entire home with great-sounding music. 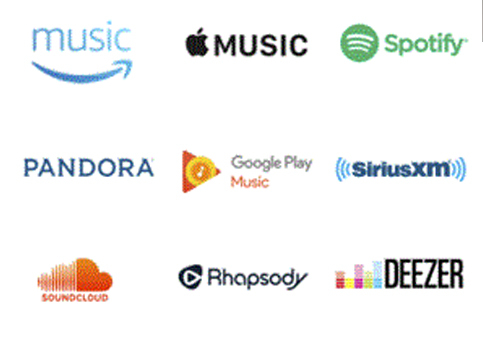 Use one app to stream different music to Sonos speakers in different rooms. Or send one song all through the house. Contents: PLAYBAR, power cord, Ethernet cable, optical audio cable, Quick Start Guide, and Legal/Warranty information. SUB. The subwoofer for your Sonos speakers. This innovative wireless subwoofer adds deep, thunderous bass to your music, TV shows and movies. You won’t just hear the difference. You’ll feel it. Bring Out The Bass: Ready to experience your favorite music in a deeper, more powerful way? Pair SUB with any Sonos speaker. It does all the heavy lifting to bring out the lowest of lowest, allowing your other speakers to focus on producing those perfect mid and high-range sounds. More Boom For Your TV Room: Pair SUB with a Sonos PLAYBAR for a pulse-pounding soundtrack to all your favorite shows and games. Then add a pair of Sonos PLAY:1, PLAY:3 or PLAY:5 rear speakers when you’re ready for the full surround sound experience. 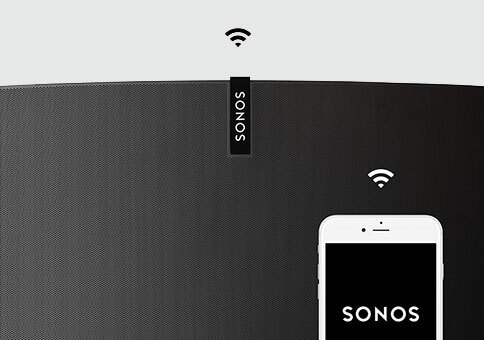 Trueplay speaker tuning: This exclusive Sonos feature fine-tunes your Sonos setup to make sure you hear the very best sound possible, no matter where or how you arrange your speakers. Combined with the SONOS PLAYBAR, your TV lift will deliver movies or music like no other entertainment system, guaranteed to make your friends green with envy. Contents: SUB, power cord, Ethernet cable, Quick Start Guide, and Legal/Warranty information. Sonos PLAY:1. Mini speaker. Mighty sound. The most compact Sonos speaker. A perfect fit for bookshelves, counters, and other snug places. PLAY:1 lets you enjoy great-sounding music wherever you want to listen. Surprisingly Powerful: PLAY:1 sounds a lot bigger than it looks, thanks to two Class-D amplifiers and custom-built drivers, all meticulously tuned to the speaker’s unique acoustic architecture. Trueplay Speaker Tuning: This exclusive Sonos feature fine-tunes your PLAY:1 to make sure you get the very best sound in any room, no matter where you place it. Humidity Resistant: Enjoy your favorite songs in music-starved places like bathrooms and outdoor patios. 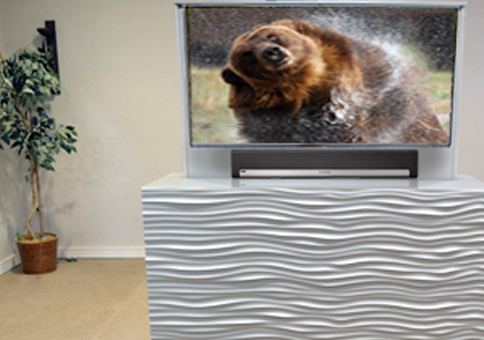 The PLAY:1 joined with the SUB and the PLAYBAR, all delivered with your TV lift ready to rock, the ultimate set up. 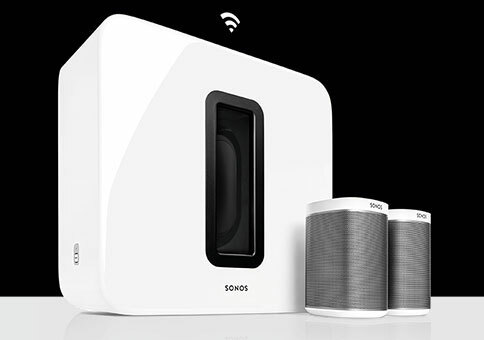 Since SONOS is a WiFi system all you need to do is connect the surround system to your WiFi and plug them into the wall and you're ready to enjoy the most advanced entertainment system to date without any hassle of running wires. Contents: PLAY:1, power cord, Ethernet cable, Quick Start Guide, and Legal/Warranty information.